Sorry, this competition is now closed! Congratulations to Louise from West Sussex, Pauline from Portsmouth, and Alice who won! For more competitions, visit: https://www.thehecticvegan.com/competitions! 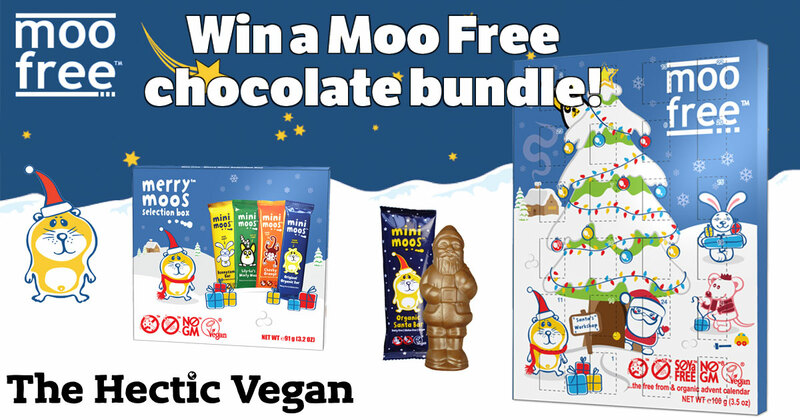 We have three bundles of Moo Free Christmas chocolates to give away! Each bundle consists of an advent calendar, selection box (containing a Bunnycomb bar, a Minty Moo bar, a Cheeky Orange bar, and an Original Bar), and last but not least a santa bar! Moo Free bring you all the flavour of great tasting, milk chocolate but know the secret of how to make it dairy free, gluten free, soya free, and vegan.